Thank you to Archinet and to the University of Santo Tomas for inviting me to be here this morning. Thank you all for being here. Last Saturday, I sat on a panel discussion in a room not too different from this one and not too far from here. I was with other architects, and our subject was “Architecture as Idea”. It was a lively discussion, a vigorous exchange of ideas, beginning with the question: “What is architecture?” The series of questions provided all of us – and I felt it keenly in myself – the opportunity to assess what we knew, to know where we stood. My understanding of architecture sympathizes greatly with how John Hejduk, the great dean of Cooper Union, described it: "The fundamental issue of architecture is that does it affect the spirit or doesn't it. If it doesn't affect the spirit, it's building. If it affects the spirit, it's architecture." This affecting of the spirit is the result of a boundary being crossed, and at the core of that impact is architecture speaking to you and telling you that your life has meaning and purpose. It does this through that “masterly, correct and magnificent play”, to paraphrase Le Corbusier, of masses, surfaces, textures, voids, materials, patterns, in the context of light and its shadows. It can result in the “affecting of the spirit” that is sometimes called an aesthetic experience. Sometimes, if not always, what comes to my mind - when I think of a structure that affects the spirit - is the ancient Roman structure called the Pantheon, in the heart of historic Rome, where I spent my third year of architecture school. The cheapest lunch to be had was at a place called Pizza Pantheon. That was not its real name, but my classmates and I called it that because of its proximity to the Pantheon. So almost every day, to and from the cheapest lunch in town, it became a ritual for me to drop by one of the most sublime spaces on earth, and observe the sky through the oculus in the middle of the concrete dome, or the sun choose a ceiling coffer or two to visit at that moment. The sun, through the Pantheon’s oculus, traversed a boundary in that coffered ceiling in order to visit its light upon some surface in that space. The impact of that ritual was to affirm for me that life had meaning, life had purpose, and that the purpose was architecture. The sun traversing a boundary in the Pantheon’s ceiling brings me to the fascinating title of this symposium: Traversing Boundaries. In many ways, traversing boundaries is the praxis of living. Life is the crossing of boundaries. We are surrounded by boundaries. We are defined by boundaries. And what defines our character is the manner in which we are constrained by, or traverse or cross those boundaries. This is also what defines our civilization. In fact it characterizes the lives of many of us Filipinos today. Without making any judgments about whether this phenomenon is good or bad, it is fascinating to behold. On any given day a multitude of us cross boundaries in order to make a living in other parts of the world. On any given day a multitude of us, here, in the Call Center Capital of the world, cross boundaries between time zones. That horizontal boundary called Sea Level is moving beyond the normal cadence of high and low tide as a result of climate change. How we respond to it causes us too to examine various boundaries. Traversing boundaries also enables us to establish connections, understand patterns. Yesterday I had the experience of a kind of boundary being broken in order to observe the presence of a pattern. One of my projects is an industrial plant in Laguna, and I normally go there by driving down South Super Highway that skirts Laguna de Bay. Once in a while, I go there with my client, who normally goes there by helicopter. Yesterday was such a day, with the opportunity to see Laguna de Bay from the air. 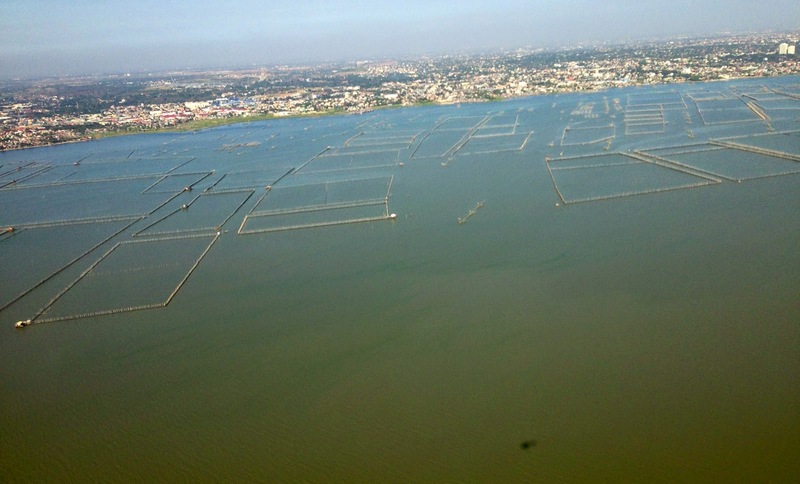 The view of Laguna de Bay and its fish pens as seen from South Super Highway is different when seen from above. The pens were in a kind of pattern, an informal grid, a grid of rectangles and squares, or trying to look like them. But they were like a plan of Rome, even of medieval Rome transforming into papal Rome, with piazza in front of palazzo. A boundary was traversed – height – in order to observe a pattern. The result of one instigator – fishermen in Laguna de Bay outlining their fish pens in the murky shallows of a lake bed – has visual similitude with the result of another – popes planning a city. Physical form traverses a boundary to obtain metaphorical form, to occupy an abstract realm, where notions like archetype or pattern reside. This subject of the abstract, by the way, was another highlight from last Saturday’s discussion and part of the enduring magic of architecture, which is that it traverses the boundaries between the real and the abstract. Any discussion of the relationship between Architecture and Idea, like last Saturday’s, would eventually involve the matter of the avant garde, of vanguard architecture, of progressive architecture. I made the point that architecture by definition is progressive, and that the Pantheon is, too, to this day, avant garde. Any site that exceeds the standard issue to bring us to the place that Hejduk described as “affecting the spirit” is entirely uncommon. Other examples, in my personal opinion, of the avant garde are Ronchamp and the Ifugao Rice Terraces. Our two speakers today, in many ways, represent the avant garde today. This may perhaps be too diagrammatic but one of them could be about boundaries that are vertical and the other could be about boundaries that are horizontal. One of them discusses traversing the boundary between inside and outside, as a commentary against buildings being giant helmets that prevent the proximity of light and air from being enjoyed by the inhabitant. The skin of the building becomes a boundary, and the detours made to get from here to the there that is a foot away can be absurd. The work of the other involves the boundary between the idea of structure as fixed, immobile, Vitruvian in the notion of Utilitas, Firmitas, Venustas. Firmness, Strength, Beauty, and the idea of structure as mobile. Of structure that can ascend and descend, depending on the need or the emergency. This challenges the notion of architecture as fixed in a place and for the ages, but does the spirit know this notion? Does the spirit recognize boundaries? Let me conclude by going back to last Saturday. Towards the end of that hour last Saturday, an hour of invigorating intellectual exchange and affirmation of our selves as architects, there was a question that arose from the audience. It had to do with the relationship of today’s architect with the modern condition of the city. At first, it struck me that the man was not asking a question but seemed instead to be pontificating, or running for public office. In so many words – and they did seem like so many words – he described the condition of our cities as wonderful when seen from the air, but shocking when seen from the ground. How the view from the air is really an accurate diagram of the gap between rich and poor, and how this diagram is blurring the boundary that normally existed between urban and rural. It seemed that his question had no end, because each word was an indictment, a finger pointing at me asking: “What are you doing about it?” At the end of his so many words, I had no answer. Fortunately, and to their credit, my colleagues on the panel had something to say, ranging from the notion that the matter was beyond our purview, outside our control, to the notion that there were fine examples in other countries of responses to the issues that the questioner was raising. I had no answer then, but I did have an answer later, when I was alone. It had to do with the answer that John Hejduk had given to the question: What is architecture? "The fundamental issue of architecture is that does it affect the spirit or doesn't it. If it doesn't affect the spirit, it's building. If it affects the spirit, it's architecture." And how does architecture affect the spirit? Architecture affects the spirit by crossing the boundaries of our senses in order to enter our souls. And there, what does it do? There, what does it tell us? It tells us what I believe that architecture is here to tell us. It tells us that we too must traverse boundaries. We must traverse that boundary that separates us from our neighbor, and more specifically, that boundary that separates us from the least of our neighbor. Who was it that said: "…whatever you did for … the least…, you did for me." It is the least who occupy what should not be occupied, the parks and park benches, the sidewalks, our view corridors; the least who mar our civic vistas because they traverse the boundaries of civic decorum; the least that often sell their votes to the municipal ignobility who then further visit their depredations upon our once-beautiful cities. But it is also the least who need to be a focus of our attention, who ask us, not so much in words but by their very presence, to cross that boundary that separates us from them. This moment, this time of year, becomes an opportunity to remind us – to us who are architects or who aspire to be architects - to visit – re-visit – and traverse that boundary.